A large majority may have heard about the term Ism-e-Azam. The great Sufis have produced enormous works and explanations Ism e Azam according to the knowledge of Quran. Isme-Azam contains the Great name of Allah. Many people know the benefits of Ism e Azam but they struggle to get his/her Ism e Azam and even if success to find one they get it wrong. If you do not know how to know your own ism e Azam then this article is very helpful for you. In this article you can learn very simple method to find to your personal Ism e Azam. If you want to know your own isme azam the easy method is as under. First you find your name’s adad. To find the adad in urdu click the link given below. After you found your adad then match this adad to asmaul husna(allah’s 99 names) which name will matched with asmaaul husna its your isme azam. If you not found your Ism e azam in any allah’s name then you take two name of Allah and match with them. If you match your name adad with two name of Allah then this digit is your isme azam. Even if you cannot find in two name of Allah then you can add more then two name of Allah like 3 or 4 names of Allah. For example my name’s adad is 187 I did not found in any Allah’s name so I take two names from Asmaul ul Husna the two names are “Ya Allahu” and “Ya Subhanu| because Ya Allahu adad is 66 and Ya Subhanu adad is 121 by adding them we get 187 i.e 121+66=187. So this is isme azam for me and also for person who’s adad is 187. The great Sufis and Auliya Ikraam state that every individual has an Ism-e-Azam. You can know your ism e azam wtih very simple method. Every name has a quantity, according to the concept of Haroof-e-Abjad. 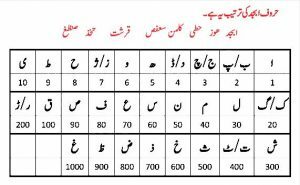 “Naseema: this name’s adad according to Abjad chart is 165. 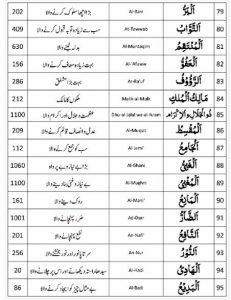 So now it is necessary to search for Allah’s name, which also has 165 numbers according to Abjad chart. If one name of Allah cannot be found with 165, then two names should be added and the process should continue until a name or several names make up 165. We can not see 165 in Asm ul husan so we search this into two names of Allah and we find them in Muhaymin, which is 145 and Wudood, which is 20, make up 165. So the Ism-e-Azam of Naseema is Ya Muhaymin Ya Wudood Ya Allah. Note: It must be noted that Sufis have advised us to associate the Zaati name “Allah” in the end of every ism e asam. While reading your Ism-e-Azam, you must put a YA in front of all the names of Allah. So it should be Ya Muhaymin, Ya Wadood, Ya Allah. And since the amount is 165, then the reader must read it 330 times daily by doubling it”. Asma-ul Husnaa has a very special significance in Islamic belief. Every name of Allah has an angel, who constantly prays and repeats that name of Allah. And the more you read your Ism-e-Azam, the closer this angel will come to you. This angel will gradually help and assist you in fulfilling you wishes and hopes. You will suddenly feel a help and assistance coming from the unseen for all your matters. Read your isme azam after every namaz according to your digit and then pray to Allah, Inshallah Allah fulfill your every desire. We hope our little try will make easier now in order to find digits according to names. 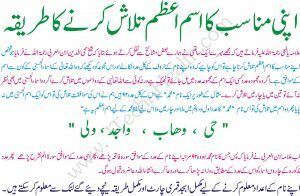 Try this and also help to your family and friends about Ism e Azam. If you face difficulty to know your Ism e Azam according to this method then you can also use Ism e Azam Calculator for this purpose and by using this calculator you can find your Ism e Azam very easily. To download Ism Azam Calculator here I am providing the link.